When you think of Valentine’s Day you probably imagine cute cuddly animals like puppies and kittens. However, there are plenty of other animals that are just as worthy of your love. Although they may not be as cuddly, animals such as bats, bugs, snakes and spiders all play an important role in the environment. 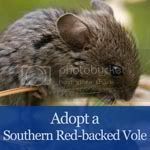 This Valentine’s Day show some love for one of those less-than-glamorous animals, the Southern Red-Backed Vole. At 13 cm from head to tail, it is rare to spot one of these voles. And even more since these voles were considered extinct until they were discovered in Burns Bog (Miller 2004, Statement 20). Habitat destruction from human activities, such as the south-fraser perimeter road, is the main reason for their declining numbers. By symbolically adopting one of these critters from the Burns Bog Conservation Society, you are helping to ensure that the bog and all the animals that live here are saved.